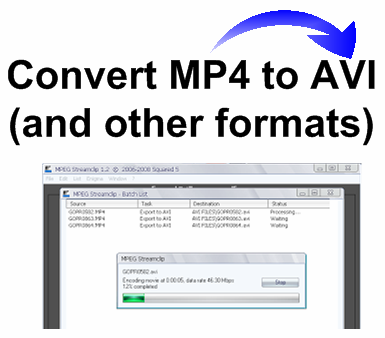 By the end of this tutorial you will be able to batch convert MP4 clips to AVI using a free MP4 converter. However, if you simply want to edit your videos without converting the video files, you might wanna check out one of the best video editing software. The majority of the programs in the top 10 work with various video formats - so you can edit your clips directly, no matter what format. This is how I do it now - I prefer to use and editing program that manages to import most formats. What Are the Advantages and Disadvantages of Working with AVI Files Instead of MP4 Files? Perhaps the AVI video format is the easiest to handle for any video editor. I don't think there are any video editors - even default ones like Windows Movie Maker or free software on the web - that don't import AVI files. AVI video is uncompressed and thus the quality is maximum. Video cameras (compact photo cameras as well) that output the clips in AVI do so without working too much on the footage (with their internal software). GoPro HD camera for instance does some serious work compressing the video to MP4 format in H.264 encoding - this is keeps the quality high and at the same time keeps the files small. Maybe it's just me but I find that AVI video is slightly sharper than other formats. The shapes seem to be better defined. And if you are shooting with long depth of field (DOF), which most point-and-shoot cameras have as default feature with their lens system, this means that the objects in the background will also look pretty good. The biggest disadvantage of AVI movies is that they are too large, in terms of megabytes or space occupied on your hard drive. That's why for serious video editing you need tons of storage space (fast transfer hard drives starting from at least 500 GB), not to mention tons of computing power (powerful processor, lots of RAM memory and a solid graphics card). To have a sense of the size difference between the two types of files I can tell you that an AVI clip is 5.31 times larger than a MP4 clip. For instance a clip shot in 720p (lowest resolution considered to be HD) at 30 fps in MP4 occupies 45,258 kilobytes (45.2 MB) whereas the same clip converted to AVI occupies 240,340 kilobytes (240.3 MB). That's a huge difference! First of all I demand that you go right now and thank Stefano Cinque, the Italian developer behind Squared5, for his majestic work with MPEG Streamclip. Please do that! This is a world class program that he's giving away for free. We owe him that much! Browse your computer in order to reach the folder where you store the files that you want to convert. You can select multiple files either by holding down the Ctrl key on your keyboard and clicking on each file that you want to add to the batch list or by holding down the left mouse button and selecting mini batches of files (when the files are selected release the mouse button). Choose a task - choose Export to AVI - if that's what you want to do with your video files; if not then choose other video format from the list. Click OK. Select the destination folder of the files to be converted or simply create a new folder. Choose the export settings for your video. The only thing I do here is I slide the quality level to 100% (the default setting is 50%). I leave the resolution and frame rate as in the original clip. Click To Batch button. In the new window click the Go button. The status of the files will transform from Waiting to Processing... and eventually to Completed. After this you can close the software coz you're basically done. It's that easy to convert MP4 to any other type of video file! Go and view the files in their new format and import them into your video editor. You can also edit GoPro HD footage with Magix Edit Pro Plus which is unfortunately not free. It allows you to directly import and edit the MP4 videos without having to convert them. This saves time and energy. Go for the free trial and see how it goes. it into avi and even the preview is smooth! @Bushman Of Yukon - Thanks! Try to use the video converter with other types of files as well. @Kornel - I'm glad it's working fine! Cheers! Strange. I am in the process of organizing my videos from the last five year. All the ones I shot with my old Sony camera (cybershot bought 2005) has the MP4 ext. My new video HD camcorder (also sony) has .avi files. I decided since the AVI was newer, that I should convert the mp4s to avi. Well, I just did a trial run on one file (I am using the 4Videosoft MTS converter) and the original mp4 file was 12MB, the avi converted file is only 5.88! I was looking online to see if this was usual, and found your post saying avi takes up tons MORE space than mp4! The converted file plays everything the original has just fine. Could it be that the converter I am using is awesome in that it reduces file sizes? Interesting! I guess your video converter is somehow smarter or maybe it cuts some of the bit-rate thus leaving the same quality (seemingly) for the eye to see. Do the AVi files have the same resolution as the mp4 files? hey, i followed your steps. but it doesn't worked. it says that " File open error: unrecognised file type. " I'll try to convert it myself and see how it goes. Thanks! I would suggest MP3 format for music. It's universally accepted by most video editors. I haven't worked with Movie Maker in years but mp3 should be accepted. Another accepted format is WMA. I hope this helps. If not, shoot me an email and tell me what exactly do you want to do. Play the MP4 files with FLV Player. My advice would be to shoot in 720p or even lower resolution (R1 848/480 pixels @60 fps). If you convert the MP4 clips to AVI they should play well even on a weak computer. Tell me how it goes. i shot some footage using gopro at 1080@30fps and i am trying to convert to use virtualdub/deshaker to stabilize a bit more. I ran a Toughmudder which is a race with obstacles, hills/running/jumping/electric shock/water, etc. The files are large mp4 files and conversion to avi explodes them. is there another program that stabilizes the shake without using avi and one that i won't lose lots of resolution on. Thank you. (on another note, i might shoot at 720@60fps next time) Thanks again. Hmmm... I didn't loose any quality when I converted my MP4 files to AVI with MPEG Streamclip. Is that what you mean by "exploded"? Of course the file size was enormous compared to MP4 but the quality remained the same. If you shot the race with the GoPro on your head, there's not much stabilization you can do. I mean, you could stabilize it a bit digitally but it will remain more or less shaky. If you want steady footage with GoPro you should have someone else shoot in third person. Just look at the GoPro videos on their channel. Most of the shots aren't POV - it makes people dizzy - you can't watch POV too much. In Adobe Premiere/After Effects you can use the proDAD Mercalli plugin and that will stabilize your footage. I don't use Adobe but my friend who's a professional videographer - Calin Manescu - uses it and he said it's good. In Magix Movie Edit Pro Plus I import MP4 without converting and I sometimes stabilize footage. But most of the time I shoot with my DIY steadicam and that grants smooth footage. Get the free trial of Magix and see if that works for you. I use it for Mp4 files - GoPro HD 2. Haven't used the GoPro 3 yet but I assume Movie Edit Pro Plus can handle those files. GoPro Studio is another software that will convert your mp4 files to avi.